Ok, so this took me WAY TOO LONG to fully get… I have higher hopes for you guys, tbh. Lol. Our breath is the most POWERFUL thing we have to change our bodies and minds. Straight up. The science behind it is astounding-- and if you’re willing to be open and put a little bit of effort in, the personal experience is even more incredible. Awesome, right? We are SO excited to share this with you. As it’s changed BOTH of our lives in a BIG way and we’ve also seen thousands of other people, (of ALL ages) benefit from similar techniques. Yeah, the struggle is real, but it really doesn’t have to be such a struggle. We should ALL know how to use these freaking amazing tools. So basically, we have a nerve near the back of the upper throat. It’s called the Vagus Nerve. If you take a breath, pulling in and pushing out the air, from the back of the throat, making a verrrrry light snoring sound-- this is Oujaii Breath. (We recommend getting more one-on-one assistance before using this breath). This is an age old Yogic Breathing Technique. When doing Oujaii, you are stimulating the Vagus Nerve, and strengthening it. It’s called, increasing Vegal Tone.. Think pumping iron at the gym, but for your nervous system. “The vagus nerve starts in the brainstem, just behind the ears. It travels down each side of the neck, across the chest and down through the abdomen. ‘Vagus’ is Latin for ‘wandering’ and indeed this bundle of nerve fibers roves through the body, networking the brain with the stomach and digestive tract, the lungs, heart, spleen, intestines, liver and kidneys, not to mention a range of other nerves that are involved in speech, eye contact, facial expressions and even your ability to tune in to other people’s voices. Increased Vagal tone is linked to something called the ‘upward spiral’ -- this means you have increased positive emotionality, pro-social behavior and sympathy. More simply- you start to feel better about yourself which increases your self-esteem. Now that your self-esteem is up, you feel better about connecting with other people aka pro-social behavior. And now that you’re more social and reaching out more, you’re feeling more connected and tuned into others feelings aka sympathy/ empathy. OK. So this is huge. It’s like the Holy Grail of the body/mind connection and how to harness its power to feel good. We both practice this EVERY DAY. And I can tell you with complete confidence, this tool has totally changed my life and it can change YOURS too. I have overcome so many non-beneficial thoughts and feelings using this and we want you to experience the same relief. This post dives into a topic that carries a bit of heaviness, but is SO important to talk about openly and honestly - especially as women finding our way in this world. Life is all about connection. This is what makes the world go round, this is what we need and crave as humans as part of our happiness. But, what happens when there’s a relationship that, well, just isn’t so nourishing for you? You know, that relationship that doesn’t feel so good – it can be with a friend or your girlfriend/boyfriend. Sometimes we don’t even realize that this relationship is becoming toxic or unhealthy. We’re rarely taught in school or even talk with friends about the warning signs of toxic or unhealthy relationships, let alone how to navigate our way through them if we become entangled in one. As someone who was in an extremely toxic and emotionally abusive relationship for about five years, over the course of that time, my soul knew that what was happening wasn’t good for me and knew something was wrong, but the abuser has a way of being so manipulative, that I didn’t REALLY know how bad things had gotten. A few months after I had finally mustered up the courage to leave him, still not even fully aware of the trauma I had gone through, I stumbled across a Facebook article that listed the warning signs of abusive relationships. Reading through this article, I began to feel the emotions stirring inside of me like a tidal wave – fear turned to anger, turned to humiliation, turned to sadness, turned to rage. Bullet point after bullet point, this article resonated with me and I sat there sobbing at my desk, feeling so alone and ashamed of myself. Over the course of this abusive relationship, especially when things were becoming more extreme and painful, the times when I needed support the most, I began to isolate myself from my friends and my family. I was too embarrassed to let anyone know what was really happening, although people who were really close to me started to suspect that something wasn’t quite right. About a year before I ended the relationship, I had a group of close friends ask me to dinner over pizza AKA to have an “intervention” and tell me how worried they were about me. Well, I listened to what they had to say and then proceeded to shut them down pretty quickly, saying what I knew would get them off my back, things like, “He’s changed,” “We’re really happy,” and “You don’t really know him” - just as most victims do to cover up their feelings of being ashamed or trapped and in denial of what is really happening in their life – fearful about how much it has become out of their control and not knowing how to reach out for support. Connection is such an important part of life, but boundaries are just as important. Getting to know yourself and what you will or will not accept in your relationships is critical to your own self-development. For me, this toxicity came with a romantic partner, but manipulative, emotional and verbal abuse can come in friendships too. It’s so important to learn how to distinguish the difference between what is nurturing for you and what feels hurtful and then how to use your own voice to express when something doesn’t feel safe or healthy for you. People who are abusive or manipulative are very good at shutting down the expression of YOUR feelings and in that process, making your own intuitive distinction between healthy and harmful blurry, so blurry in fact, that you start to mistrust yourself and your own judgment. You feel like you’re the one doing something wrong! 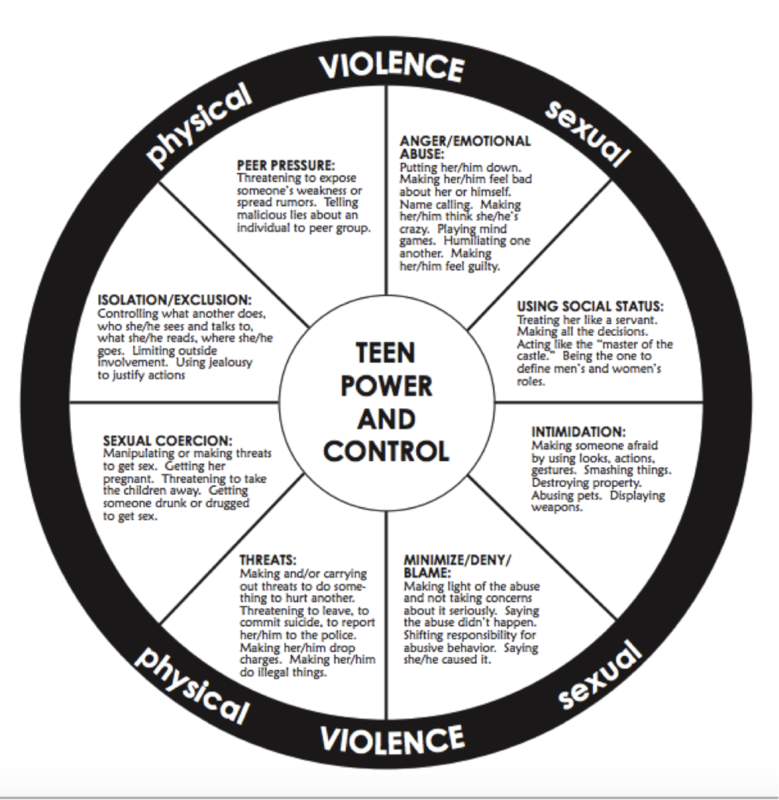 Oftentimes, we think that abuse is only physical, but it can take on many other forms. Emotional abuse is so tricky because you can’t see it, there’s nothing tangible there to know what’s really happening. It takes on this push and pull with the other – you want to be so close to them and they have a way of drawing you in, making it feel safe and then they do something that is so hurtful, you just can’t believe it, but then they turn around again and give the illusion that you are loved. This type of manipulation is confusing! My ex-boyfriend would say incredibly mean and cruel things to me and when I would start to cry or try to “explain” myself, he would apologize for hurting me, but always follow it up with a, “well, you made me do this” or “it’s your fault I got so angry.” When really, that outburst of his had absolutely NOTHING to do with me. I just became the punching bag for his own pain and anger he had accumulated over his lifetime and had never dealt with. I’ve been out of this relationship for four years now – still working on healing my heart and especially my mind. Toxic relationships take a toll on our feeling of self-worth, especially our feelings of deserving love and trusting others. I’m lucky that I have incredibly supportive, loving and nurturing friends who have helped me through this healing process. They listen to my stories without judgment, cry with me and many of them share their own stories of being in similar relationships or having similar experiences. I’m learning to trust myself again and to realize that wounds can’t be extracted from our system, we have to take the time to heal them, to accept and forgive ourselves and continue to focus on the things we want to grow in our life. If you’re going through something like this, it’s important to know that you’re not alone! The first step is to identify the warning signs and then ask for help, reach out to a trusted adult like your parents or school counselor. You will be ok. There are people who care and it is NOT your fault. And remember, these behaviors don’t just show up in romantic partnerships, they can also come from friends too. So, first of all- let me be trite and say, you ARE NOT your thoughts. What does this even mean? There is something unchanging in you. It IS you. It is the observer who witnesses you thinking your thoughts. This separate and unchanging, infinite part of you is called, the Self. I know, deep, right? The Self is the part of you that knows you are hurt or getting mad, but is not actually mad because it is just witnessing the drama of anger happen. Thoughts, ‘good’ and ‘bad’, come and go...all the time. Like ALL DAY LONG. If you begin to identify with these thoughts, you’re buying into an illusion. If you let them pass like clouds in the sky, you won’t get hung up on any of them. This may be easier said than done... but we can help show you how. With that said, action and behavior mostly stems from thoughts. So, they are important. Thoughts influence our energy level, our mood, and ultimately what we decide. Now for the science: NEUROPLASTICITY. Bam. This simply means: the brain can change; it is malleable. Which means, 'YOU' can change! If you’re thinking thoughts like, “I’m not good enough. No one will love me” -- This thought is creating a neural pathway or ‘road’ in the brain. The more you think this thought, the deeper the channel/road or pathway gets. Similarly to, if you drove a car over the same dirt road every single day, the grooves from the tires would become deeper. It would create a track which would make driving down that same road easier and easier. The more you think the thought “I’m not good enough. No one will love me”, the easier it gets for your brain to go there, to drive down that ‘thought road’. The road or pathway is deepening. SO you may find yourself in a good mood, but all of a sudden having this thought come up, as if you’re on autopilot. NOT COOL BRAIN. It's SO important to understand the link between thoughts and beliefs. If you keep thinking the thought, I'm not lovable, most likely, you may start acting accordingly or in alignment with this thought. Your behavior will begin to match this thinking, like surrounding yourself with people who may not fully love or appreciate you. Then you see your outer world and environment match this thought of "I'm not lovable". Abracadabra! Like magic- now you have 'PROOF'. When we have 'proof', "well, look, see-- I told you I was unlovable..! ", then our thought just became a belief we adopt. But it can be countered! STEP 1: Awareness-- just being aware, “Hey, this thought doesn’t make me feel good… I want to choose a different thought” - is HALF THE BATTLE! STEP 2: If you choose a different thought, one that feels better or is maybe the opposite, “I’m awesome and totally lovable”, (even if you don't fully 'believe it yet)-- you’ll begin to create that new pathway. And the less you use the old, “not good enough” road, it’ll loose it’s depth and start to fade. (If these thoughts have become beliefs for you, where your reality is supporting the negativity of the mind, then it's important to ask yourself-- if I knew I was lovable (or whatever positive spin is true for you... smart, successful, safe, needed, etc.) HOW WOULD I BE TREATING MYSELF RIGHT NOW? And then take those small potential actions and actually act on them. This is a practice, for sure, that requires commitment and patience. I personally practice this every day. We know, if you practice it consistently and with compassion, you WILL change your life- by changing your brain and thought patterns. WILD, we know. And totally worth experimenting with. It also helps to know a bit about how your nervous system works. Because some thoughts, if they are upsetting and hurtful, may increase your levels of cortisol- it helps to take some specific deep breaths while working on changing these thought patterns. This is STEP 3: The breath-work is like plowing the snow off of the roads so you can drive down them more easily. If you’re in a calm state, the positive thoughts will resonate more deeply- you won’t be working against your nervous system. (or fighting the weather conditions) However, MOST people, kids and adults, breathe incorrectly. You may actually be breathing in a way that triggers a stress response from your body!